3-Port HDMI switch connects three HDMI source devices to one port on an HDMI monitor while allowing you to switch back and forth between each one. Three separate ports allow you to connect your Blu-ray player, video game system and cable/satellite DVR to one HDMI port on your high-definition television. Or you can connect three computers or media centers to a monitor for displaying digital signage or presentations. IR extender receiver lets you hide the switch out of sight while still being able to switch devices using the remote. Energy-efficient design automatically switches to the next powered-on device when it's powered off. Hassle-free functionality requires no software, drivers or external power supply for immediate use. Switch supports Ultra High Definition (UHD) video resolutions up to 3840 x 2160 (4K x 2K) at 24/30 Hz and 48-bit True Color, as well as DTS-HD, Dolby True-HD and 7.1-channel surround sound audio. Research has shown that using multiple monitors can increase productivity by up to 50%. Common tasks such as copying and pasting are greatly improved with fewer errors thanks to not having to juggle or tab through your open windows within one display. 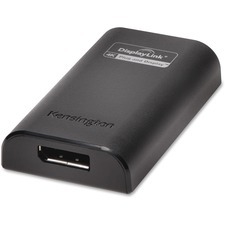 The Kensington Multi-Display Adapter makes adding that extra screen easy. Simply connect one end to the monitor and the other to your laptop or Ultrabook USB port. 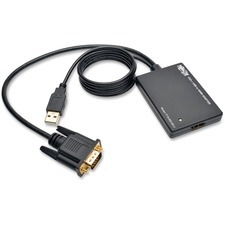 The Universal Multi-Display Adapter can also be used on projectors or HDTV screens using the included DVI-VGA adapter, allowing display on any device with up to 2048x1152 pixel resolution or 1080p for video playback. Using USB means it's universally compatible with any brand and model, including Ultrabooks. All you need is one USB to add another display option. With more and more people realizing the productivity gains of working on a 4K monitor, Kensington has an easy way for you to upgrade your laptop without the need for a 4K graphics card. 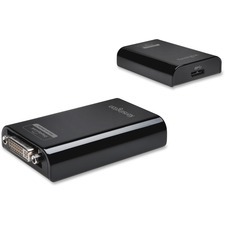 The VU4000D 4K Video Adapter simply plugs into a USB 3.0 port on your laptop and connect to the DisplayPort video cable of your monitor, projector or TV so you can see your content in Ultra HD. You can either mirror your laptop screen or extend it for the ultimate in productivity. 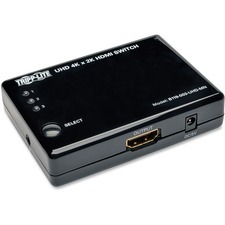 VGA to HDMI converter/adapter with audio eliminates costly computer upgrades by converting a VGA video signal for viewing on an HDMI projector, monitor or television. You can display a rich high-definition signal in your home audio/video setups, media presentations or digital signage using your analog source equipment. LED will indicate when the unit is properly connected and when it is transmitting video for quick reference. In addition to high-definition video resolutions up to 1080p, the unit supports 24-bit True Color (8 bits per channel) and video transfer rates of 6.75 Gbps (2.25 Gbps per channel). Universal design is compatible with all operating systems. Plug-and-play technology makes installation quick and simple, with no software or drivers to install. Hassle-free functionality does not require an external power supply for immediate use. Compact size is small enough to carry in your pocket, backpack or laptop bag for easy transportation.